Paragon's Classic 16 popcorn machine features an anodized aluminum 16-oz. popcorn kettle. Bright red paint and super cool popcorn graphics add the popcorn appeal. Separate warmer, stirrer, and kettle switches. Tempered glass sides, plexi-glass pair of doors, lower cal-rod heating element, old maid's tray for catching unpopped popcorn. 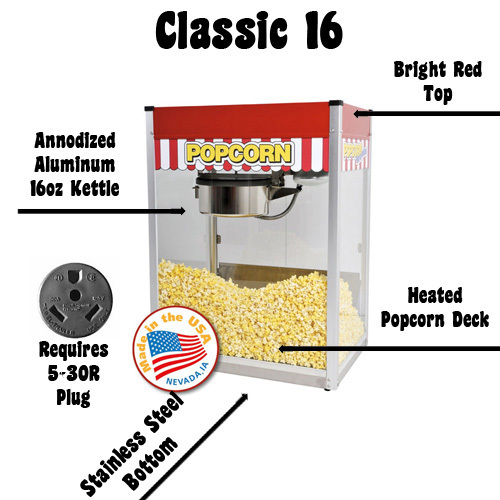 The Classic 16 offers dual rear on/off and kettle switches finish off this super fine popcorn machine. The Classic 16 popcorn machine operates on a 30 amp 120 Volt circuit (You need a NEMA Style 5-30R Outlet). This machine is ideal to use in schools or any environment that needs lots of popcorn. This popper will produce 300 servings per hour. 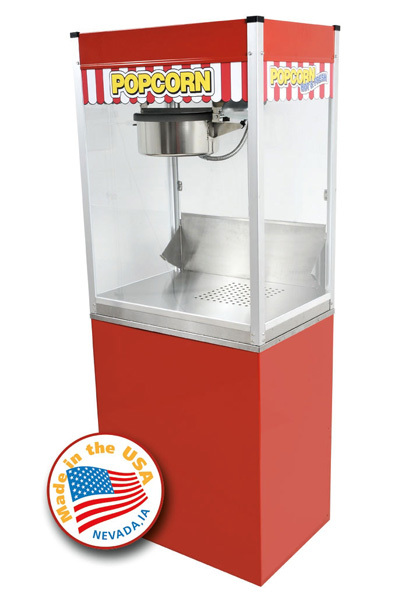 This full-feature popcorn machine uses a gas spring assisted kettle for easy unloading, four-switch operation, kettle "ready" lights and a Hard-coat anodized aluminum kettle for superior performance and ease of cleaning. The heated warming deck will keep popcorn warm and fresh for long periods of time. 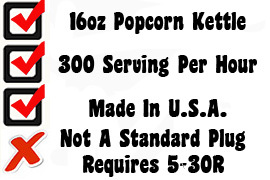 One serving will produce enough popped popcorn to fill approximately sixteen 1-oz bags. Three-Year Manufacturer's Warranty. Complete with Paragon's exclusive three year warranty. This item will ship by truck. Please provide a commercial address to avoid additional charges. Schools, Convention Centers, Zoos, Midways, Concession Stands, and Snack Bars.